KYIV. Feb 9 (Interfax-Ukraine) — Incumbent President and presidential candidate Petro Poroshenko has said that as part of the monetization of subsidies for utilities, every household in need in Ukraine will be paid UAH 1,500 in cash on average. "About 4 million households will finally be able to receive cash in March for the month of February. These payments will amount to an average of UAH 1,500 per household," Poroshenko said at the Open Dialogue public forum in Kyiv on Saturday. The president said the monetization of subsidies will be implemented in March. He also said that Ukraine should discontinue purchasing natural gas from abroad and should increase its own production instead. "We should not buy gas from Russia. We should not buy imported gas at all—there should be enough Ukrainian gas. 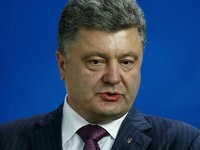 I am proud that during my presidency in the last five years Ukraine finally jumped off the Kremlin's gas needle," Poroshenko said. He also called on those in attendance not to trust some presidential candidates who promise to make gas "twice cheaper, four times cheaper, six times cheaper, or even free" because it is all "just fables."